Forest roads,misc POI's, trails and restricted areas. This map has routable roads but some roads are actually not passable so the routing will not work in all cases. WARNING: Many roads in the forest system are NOT open to motorized vehicles. 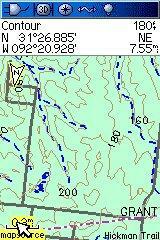 You must reference the motor vehicle use maps located at the forest website. The data contained in this map was compiled from forest service shapefiles. 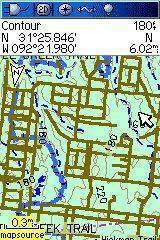 Below are two screenshots showing with and without Kisatchie data using maps4gps Louisiana Topo as the base map.